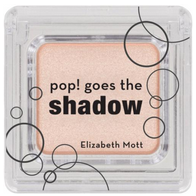 This eye shadow is super fun! It has a pretty and simple shimmer to it, and goes on super nicely. A little goes a long way in the way of application. It also has very little fallout when being applied. The color is definitely more sheer than it looks in the container. It's not incredibly pigmented. There are only 7 available colors (bummer!). It's a very mediocre eye shadow.